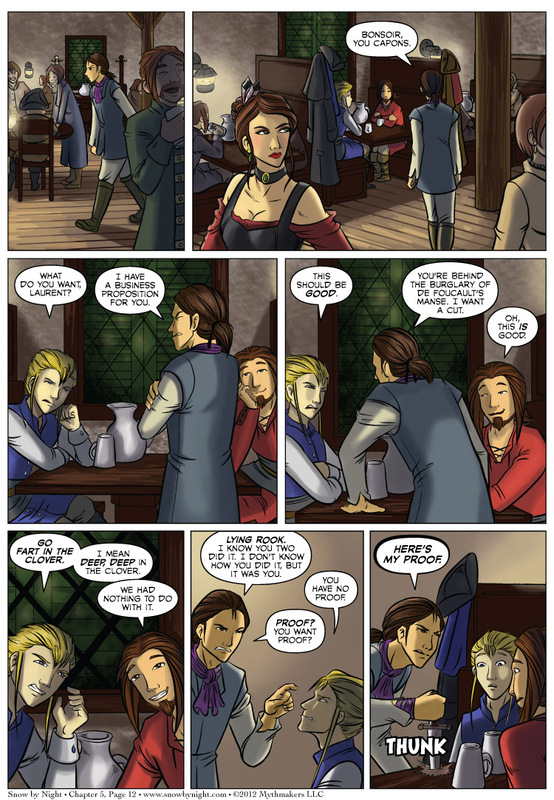 Laurent makes his appearance at the Harp & Trumpet in Chapter 5 Page 12. What, you thought we were done with him? Oh no. Not by a long shot. Our vote incentive today is a panel from Brittany’s pencils for page 13 where she makes some commentary in the panel borders. To see, please vote for Snow by Night on Top Web Comics. They’re not too good at controlling their expressions. They may want to work on that, though that’d probably make things harder on you. Never been tempted to fart in clover until now…. I know! I’ll threaten two extremely dangerous criminals while simultaneously entrenching my only weapon in a table so I can’t actually use it! I see no problems with this plan whatsoever.